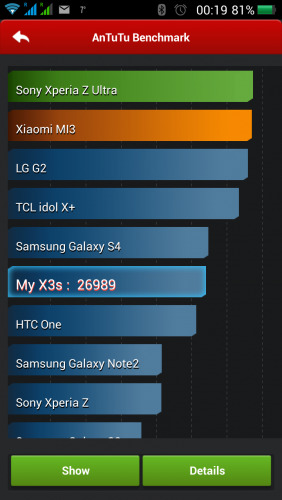 This thread is about the The JIAKE X3S MTK6592 1.7GHz Octa Core 5.0 Inch HD Screen 3G (I got it in silver/white from coolicool.com). Will be updating this thread with relevant info! The JIAKE X3S is a very light and stylish phone (only 8mm thick), especially in silver/white, the battery is incredible thin. It actually looks a lot like the Vivo Xplay. It comes with preinstalled screenprotector (it has cutouts for the earspeaker). The build quality is good, much better than on my HDC Note 3 clone. And you can tell that this is not just a cheap clone. 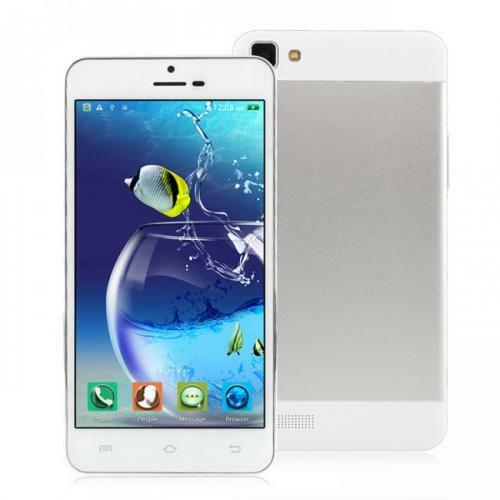 The screen is sharp and clear with nice colors and a good viewing angle. Actually really nice! Also there is no bad backlight bleeding in the screencorners like seen on other chinese phones. The backspeaker and earspeaker is really loud, and the quality is good. Maybe not like on real highend brands, but still much better than on my HDC. The phone also have "air gestures" control in the camera, gallery, desktop and musicplayer, like we know it from Samsung devices. But you have to keep the hand pretty near to the screen, when you wave it to the side, if not - the sensor will not register it properly. The camera is very good. One of the better cameras I have seen in a chinese phone. The EIS and Zero delayshutter option also works very good (it can take photos very quick), and it also have the object tracking mode. So it can track focus on a moving object. You can shoot pictures with the air gesture mode or even just with your voice, but you have to say something in chinese (sounds like the word "Hi-jo" there is an example you can listen to). The phone has no app drawer, it just places all apps on the desktop like iPhone does. (but it seems that you can have unlimited desktop pages). But if its a problem you can always just install another launcher like for example Nova Launcher etc. The Dual Sim option also works good. And currently I use 2 Sim card just on the GSM network as I have 2 numbers. When I want to call, sms etc. it can be setup to ask what Sim you want to use, or you can also just set a default Sim to be used always. The GPS locked in only 30 seconds when I tested it my car, so it seems to be really good/fast. Overall the phone is a pretty nice device, it looks good, performes well and have a okay good camera. I do not agree in that this camera is "just" like in all the other chinese phones, because it's not. It IS actually a better camera - maybe not best of the best, but still a reasonable camera for pictures and video. The camera in my HDC clone is 10 times worse! In Antutu it scores OVER an original HTC One, so that is pretty nice, if you also think about the low price! I got the silver/white version because I think it looks nicer than the black/blue version. The silver/white version reminds me more about the Vivo Xplay. In black it more just look like all other black phones. And I believe that scratches will be less visible on the silver/white version than on the dark blue. 2. After that make the backup compatible with spflashtool by choosing "prepare blocks for flashtool" with mtk droid tools, inside the backup folder there will then be "!Files_to_FlashTool"
7. It should connect and spflash tool should flash the 2 EBR files, and end with a GREEN round image, that means it is done! 10. A full factory reset afterwards is recommended to clear everything up, but not an requirement! CWM Recovery can be installed on the device with MTK Droid Tools. Edited by watalee, 29 May 2014 - 02:17 AM.